In the Kindervilla international Preschool & Kindergarten we nurture and care for 2 groups of 20 children each between the ages of 3 until they enter school. Each group has three pedagogic educators and one assistant. Each group has at least one teacher who is an English native speaker. Each group is separated into Preschool children and Kindergarten children. The children are split according to age and their individual stage of development. Throughout the day each group takes part in different activities and learning hours. But why this kind of separation and what does it involve? Our concept in the Kindervilla follows the school concept of the USA. “Preschool” means Kindergarten and “kindergarten” is the German preschool. The separation into these two groups in everyday life proofs to be very useful. Children at the age of three are at a completely different stage in their development compared to children at the age of five or six. And they also have different perceptions which mean that the older children are quickly bored and unchallenged. The consequence is usually that the child gets into a lot of trouble and becomes aggressive. That’s what we want to prevent by separating the groups. This enables us to nurture and care for the children according to age and without them getting bored. By using this method teachers as well as children profit a lot. 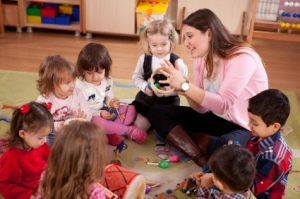 Parents whose children have been in the nursery know the daily rituals very well. These will basically stay the same, we only adjust our activity offers to the ages of the children. We will for example go on trips to places that older kids know more what to do with than the younger ones. With regard to the upcoming school start we put a lot of emphasize on independence and the ability to concentrate. We teach them for example to do chores for a longer period of time and to raise their hand when they have questions. This is very important for the school start, but it is quite hard for a lot of the children to abide to these necessary rules once they start school. To make the change easier we prepare them. Nevertheless children are children and they are allowed to stay that with us. We approach the whole process playfully. This motivates the children to participate and it is easier for them to plunge into the school routine afterwards. Did your child stay home with you for the first three years? The starting position is obviously completely different. In this case we are in close contact. We, the pedagogues from the Kindervilla, would like to know in which stage of its development the child is and what your aims and wishes have been. We tie in on this point and introduce our concept to you, how we are able to support your child the best. It is of course a big change for the child as well as you, the parents, to come from home to the Kindergarten. But the children get accustomed to everything very quickly and have a lot of fun and enjoy themselves. 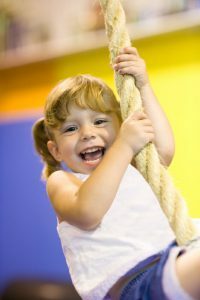 We want to further your child’s independence and ability to concentrate. No matter if they were with us from baby on or when they are three, each child has to go to school. The better the preparation the easier it is for the child to cope with the school routine. The children in the Kindervilla are naturally not allowed to do as they wish. We don’t put up with aggressions in any form but they are allowed to make use of our offers however, when and as long as they want. Through our every day rituals for breakfast, lunch and nap time we convey security and stability. Children learn playfully that there is a daily routine and that there are rules which have to be abode. The little ones are allowed to play, cavort and learn whatever they want. Is the start of school coming closer, we structure more. The children get chores that they have to do for a certain length of time. They also learn that we do not talk all at once and that we have to raise our hands when we want to speak. Otherwise nobody understands us and we don’t understand the others. Through self experience the children are shown, that there have to be rules so everybody comes to its own. We want to be your partner in the process of the education and raising of your children. We see ourselves as an extension of your home and we would like you to feel the same in the Kindervilla. We advise you to attend our Coffee Mornings and Tea-and-Cake events. Coffee Mornings: parent-teacher-conference to the latest education topics of the children. Tea- and cake afternoon: information event about all topics around the Kindervilla. We developed different activities to give you the opportunity to partake in the development of your child in the Kindervilla. There are alternately mother, father and grandparents days, Halloween parades, holiday festivities, parent-caretaker conferences, weekly newsletter for kindergarten-children and preschool-children and the daily personal exchange between parents and teachers. The volunteers are a voluntary parent group that supports us with different activities throughout the week. Parents are always welcome and bring new ideas. We recommend you to participate in the Kindervilla activities voluntarily. If you are interested please talk to us. All children are cared for in one big group, before they move on to their own groups. Current information about the child is exchanged, which will be passed on to the head teacher later on. The diary is also handed over during this time. After the little ones said good-bye to their parents we start the day unhurriedly. This means: a few kids are still tired and look for security and closeness of the teacher. Others are awake already and take advantage of the offered game and activity opportunities. Children can only start their days infused with energy if they get the right nutrition. That’s why it is essential to eat the right breakfast with valuable vitamins, fresh fruit and vegetables. Before and after breakfast we wash hands and faces together with the children. We meet with the children for a kids conference. They now have the chance to tell everybody about things they have experienced, we sing together, play finger games and “place changing” games. We talk about the things to come that day, which are coordinated according to the children’s needs. During this time there are guided offers in groups for kids of the same age. 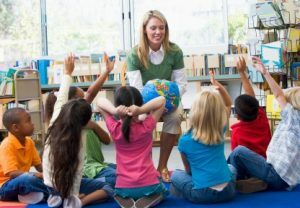 Preschool-children and kindergarten children are separated during this time, to enable the teachers to interact with the kids more effectively according to their stage of development. The children are instructed and taught in different rooms with varying activities. Depending on the program we offer for example sports, mathematics, English, arts aso. We nurture and challenge the self-sufficiency of the children during this time. The children have to decide where, with whom and what they want to play. They decide how long and how intense the game is played. If possible, this time is spend outdoors. Between 12.00 and 1.00 pm we all eat lunch together. The diet for each week is posted each Friday the week before. After lunch the kids go brush their teeth and get ready for the collective quiet time or a quiet activity. All children that are tired lay down for a nap. All other children that do not want to sleep can participate in our story time. The teachers read a story or they look at picture books together and talk about these. After the nap we use the time again as learning time. We actively learn something together, again in groups of children of the same age. To refuel we offer a healthy afternoon snack (seasonal fruit/vegetables and energy suppliers like rice crackers, whole food bread and cream cheese, now and again pieces of cake, when it’s somebody’s birthday). The children spend the rest of the time either in the garden or in the group room. According to group size, the kids will spend the rest of the day in a big group. This will give the teachers the possibility to rework their day and prepare up-coming projects and learning hours. The children can snack on fruit and vegetables. The parents will be told about special incidents. Teachers say good-bye to children and parents. 6.00 pm: the Kindervilla closes its doors. Starting with kindergarten age children are extremely perceptive when it comes to take over bad habits. And it takes a long time to get them to act properly again. That’s why we put a lot of emphasis on proper table manners and conveying them playfully. Eating for us is a ritual. The tables in the dining area are set beautifully, which not only two teachers do but also two or three of the older children. Before everybody starts to eat we recite a saying together. 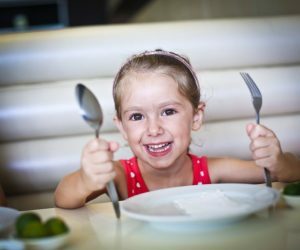 That’s how the children learn that eating is nothing that should be done in passing but that it is an essential part of life. We don’t gulp down food or drink and we want the children to get a sense of food products and involve them actively. It is important for us in Kindergarten that the children become independent. Before the snack older children are allowed to help us prepare sandwiches and cut vegetables. Friday is always special for our children because that is the day we play restaurant with candle light and beautifully set tables. Through role-play the children learn proper etiquette. They learn how to act in a restaurant and which parts of cutlery to use. What does it mean if the cutlery is laid down in a specific constellation. That’s a lot of fun for the children and they use proper etiquette naturally. We put great emphasize on nap time. Big, comfortably arranged rooms invite the children to rest and relax. We know that starting at a certain age the children don’t want to nap anymore. They feel grown up and think napping is only for little ones. We still try to get older children to lie down for a while and rest. Current studies show that not only adults profit from a short nap. Children that sleep for an hour in the afternoon memorize the learned things from the morning a lot better than children who do not sleep. This effect keeps until the next day. Studies also show that children process absorbed information during their sleep. Because we put so much emphasize on early childhood education and our offers are widely spread we would like to use this effect for the development of your child. They not only enjoy learning and easily incorporate everything new, but they keep it ”in their sleep”. But not only studies show how useful a nap is, everybody who has children knows, that the little ones are drained at one point during the day. They experiences so much and have to process those impressions. They are grumpy and cry a lot and are not able to process new information. After the nap the children seem to be replaced by a new child. They are settled down and are able to process the experiences without new information distracting them. They refueled and are ready to tackle the world again. We don’t force children to nap but we try to get them to lie down. Do they absolutely not want to do that, they have the chance to have some quiet time during the story time. The teachers tell the children a story or they look at pictures books together. Children who do not nap have some quiet time and they do not disturb the children that sleep. Movement is an integral part of the healthy development of your child. For us there is more to it than just letting the kids let off steam. 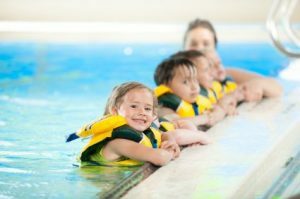 While your kids exercise, not just their body fitness is nurtured. The combinations of movements support the concentration and learning abilities and influence the kid’s social behavior positively. Movement is the main requirement for the bodily, intellectual and social development of your child. It is the main impulse for the development of the personality. New technologies and science emphasize that knowledge develops further. We at the Kindervilla also want to keep pace with progress. Both activity rooms in the Kindervilla will be equipped with SMART Boards, which are interactive whiteboard technologies. Our pedagogues will use the SMART boards to bring picture books and other stories to life and are able to introduce the children playfully with active movements to learning e.g. geometrical shapes, colors, numbers and lots more. Furthermore the children learn using new technologies and media competently. Time goes by so quickly and children go to school way too soon and have to speak freely in front of teacher and other children. The reactions of most children are quite similar: a belly ache, not feeling well and feeling put under pressure. Being unsure the child starts to stammer and, worst case, the audience starts to laugh. Having fun is not even remotely possible. We want to prevent this catastrophe by giving the children the chance to practice speaking freely. Our motto is “children understand the world through own experiences” and that’s why we want them to have these experiences through fun and games. First children get to know stories from books and picture books and learn to recite them. Even this step –for us adults a quite easy task- is not easy for children, a lot of feeling for the language is needed which they have to develop. In doing so, the children develop creative and inventive spirit. The children have to put themselves into the portrayed situation and have to learn to show feelings through facial expressions and gestures, as well as changing the tone of their voice. Are they able to master this step we move on. We don’t stay with retelling a story. Together with our teachers the children make up their own stories. They get a feeling for the language by using thought up situations. 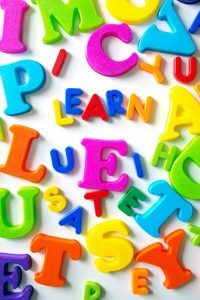 Your child is creative and has fun using the language in a creative process. Through movement and rhythm lives your child the invented piece with all senses and adds it to its treasure trove of experience. By performing the play the child learns to translate the things heard and read in school into pictures. It learns to comprehend. 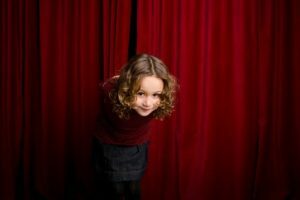 Based on experience the children enjoy acting a lot. That’s how they prepare for speaking freely. They learn to trust their own abilities. 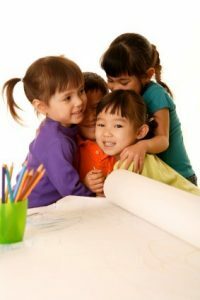 Your child will be more open, bolder and will learn how to work with others in a group more constructively. 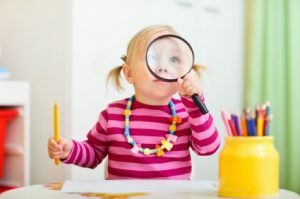 Children experience their environment with all senses, and that from the beginning on. Studies show that even unborn children feel safe and calm when their mother listens to classical music. Babies that are a few months old are able to move their arms and legs rhythmically to the music. That’s what we want to build on – like we do in the nursery. Starting during the Kindergarten time the children learn to express their feelings through speaking. In our weekly music lessons we want to give the children the chance to experience, that feelings can be expressed through music as well. 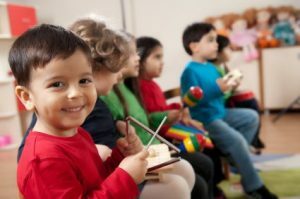 They learn nursery rhymes and an educator introduces the children to musical instruments and shows them what they can do with each instrument playfully. Musical education doesn’t just happen in the rooms of the Kindervilla. We have the possibility to visit the Stuttgarter Sitzkissen-Oper (seat pad opera) once a month, where the children learn what and how much can be expressed through music. In the nursery of the Kindervilla we have diaries, the „education and learning stories“ and „memory books“. What we do in Kindergarten won’t be as extensive because it is not as interesting anymore how much a child eats and drinks and how many times the diapers have to be changed. A kind of diary will still be used but the content will look differently. The teachers in the Kindervilla naturally observe the children very closely, but we do not judge what the child can or can’t do. We observe how the child acts within the group and report special events. We tell the parents about the past days and about the stage of development of the child each week. This way we try to find out in which areas the child might need extra support and offer this support. We also keep the child busy and encourage it in areas for example fine and gross motor skills, language development and other areas in which the child might need special assistance.